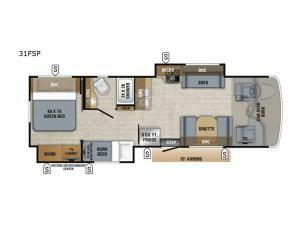 For any road trip whether traveling near or far you will want this double slide out 31FSP Greyhawk Prestige class C motor home. Your kids will enjoy their own space with the bunk beds, plus there is an additional sleeping spot with the bunk above the cab. Mom and dad will enjoy the private rear room which features a queen bed, wardrobe, and a 24" LED TV. With the ample exterior storage you truly can bring along all of your necessary camping items. Also outside you will enjoy the shade from the 10' awning and more! Get ready for a comfortable and fun traveling and camping experience with the Jayco Greyhawk Prestige class C motor home. The fiberglass exterior has vinyl graphics, a one-piece seamless front cap and a one-piece fiberglass roof. In the kitchen you will find beautiful Sienna Maple cabinets, a Dream Dinette, solid-surface countertops with sink covers, and a stainless steel sink. Throughout each model there are vinyl floors, LED lights, and ball-bearing drawer guides. 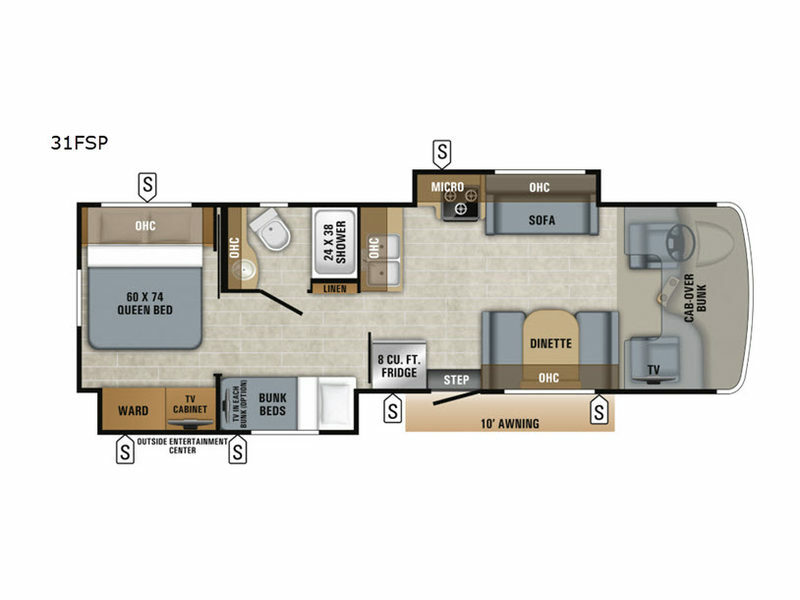 The mandatory Customer Value Package includes features such as a JRide Plus, a Jayco-exclusive Garmin Infotainment System, remote-controlled, heated sideview mirrors, frameless windows, plus more! What are you waiting for, your adventure awaits with a Greyhawk Prestige!